Water damage is a crisis any time it strikes. When it occurs as the consequence of extinguishing a destructive household fire, however, more complexity is added to an already stressful event. Consider this surprising statistic: For a typical blaze in a residence, on average, firefighters disperse about 3,000 gallons of water to put it out. Water damage associated with a fire may be more widespread than damage from a common isolated source such as a ruptured plumbing pipe. Structural damage caused by the fire may pose multiple safety hazards. 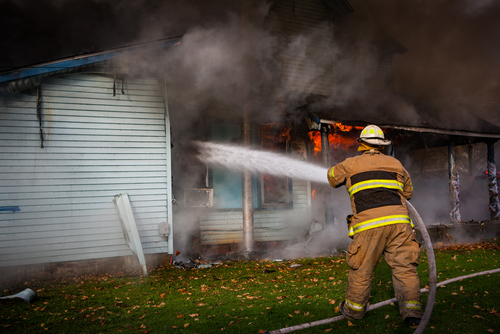 Often, you may need permission from the Fire Marshall before you can even re-enter your home to begin clean-up. For all the above reasons and more, water damage after a fire is a scenario that requires professional expertise and specialized equipment. However, the homeowner can take a few preliminary steps to mitigate some of the damage and prepare for remediation by trained, qualified specialists. Ventilate the house. High indoor humidity accumulating inside a soaked structure causes secondary water damage and makes cleaning up more difficult. As soon as you are allowed back into the house, open doors and windows and, if you have electricity, turn on fans to circulate air. Continuous ventilation supports the evaporation process that is critical to drying the premises. Remove pooling water where possible. Where water is pooled on hard surface floors, mop it up or use old towels to absorb it. If an exterior door is nearby, open the door and push water outside using a floor squeegee or a push broom. Removing these accessible sources of water lowers indoor humidity as well as preventing further migration of water into dry areas. Get soaked items outside. Absorbent materials that are now soaked should be removed to the outdoors, ASAP. This includes mattresses, sofas and cushions, drapes, throw rugs and other fabrics. Some saturated carpeting can be dried in place by a water damage recovery service using extraction equipment and may not need to be removed. Get an informed opinion from an expert before you decide to remove soaked carpeting. This entry was posted on Friday, September 7th, 2018 at 5:16 pm and is filed under Water Damage & Cleanup. You can follow any responses to this entry through the RSS 2.0 feed. You can leave a response, or trackback from your own site.